“Insurance Replacement Appraisals” are the most common types of appraisals and are used to insure jewelry for loss or theft. It is important to remember these documents should prove useful in re-making or replacing the lost item. “Fair Market Value Appraisals” generally represent a different dollar amount when compared to an Insurance Replacement Appraisal, and should assess your jewelry in order to sell, not necessarily re-make, for a fair price (according to the current market). An appraisal is important to ensure you will receive full reimbursement from your insurance company if your jewelry happens to be lost or stolen. 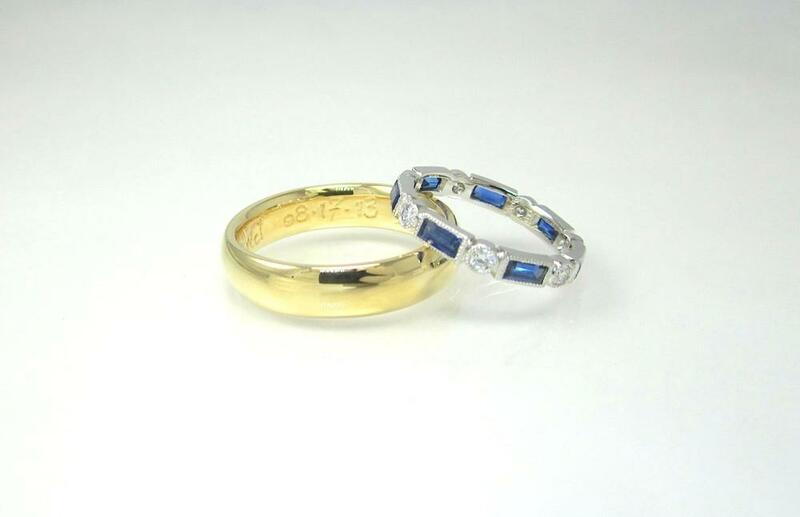 If appraisals are not updated regularly your jewelry could be insured for an incorrect amount. If you are selling your jewelry, it ensures you have documentation of a fair market price for your piece. What should be included in an appraisal? An appraisal should include detailed information about the piece of jewelry. A jeweler should be able to read an appraisal and have enough details to reconstruct the jewelry loss incurred. For example, as it relates to diamond jewelry, this includes diamond characteristics (color, clarity, cut, and color), metal information, how the piece was made, and the jewelry design style . A photo can prove to be an extremely valuable resource here, and may be required by your insurance company for high value items. Jewelry should be appraised every 2-5 years. However, insurance companies should be consulted about their specific requirements. When you bring your diamond jewelry to Booth Custom Jewelers, we take great care and interest in providing you with the most detailed appraisal possible. We love and appreciate the construction and history of jewelry making, and feel this should be evident in our appraisal documents. Appointments take approximately 30-45 minutes per piece. You are more than welcome to stay and observe the appraisal process, or leave the pieces with us. The final appraisal takes approximately 4-5 days to be completed. This includes market research, comparable sales investigation, and making sure we have a clear perspective as it relates to how the jewelry was created. Rush services may be available seasonally and an additional fee may apply. The final documents are available for pick up during our normal business hours Wednesday-Saturday. If mailing proves more convenient for your schedule, we have various shipping/mailing options. We offer expedited mailing and rush services for an extra charge. We welcome questions about the appraisal! Please feel free to ask us anything about the process or the appraisal itself. This two-tone engagement ring is handcrafted in the belle époque style, featuring 18k yellow gold and platinum. The pear-shaped diamond is set in a platinum bezel and is surrounded by a bead-set diamond halo. Platinum finials echo the halo with bead-set diamonds, and a hand-carved gallery adds depth and interest when viewed from the side. It’s not often that we have the opportunity to create two-tone engagement rings, and we are so thrilled with the final product! We had the pleasure of working on a unique ring for a customer and his bride-to-be. This delicate, antique filigree-style ring was treated to a light restoration. We repaired cracks and bends in the filigree and took the ring down seven sizes. In order to re-size the ring from a size twelve to a size five, we removed a great deal of metal and then hammered it into a thin strip. Using our laser welder, the metal was reattached to the ring, reinforcing the shank and allowing the ring to fit properly. Working with antique pieces is such a wonderful opportunity and we are always thankful for the chance to give generational heirlooms new life. Our first holiday order of the season! We recently had the pleasure of working with a wonderful client to create a special gift for the holidays. 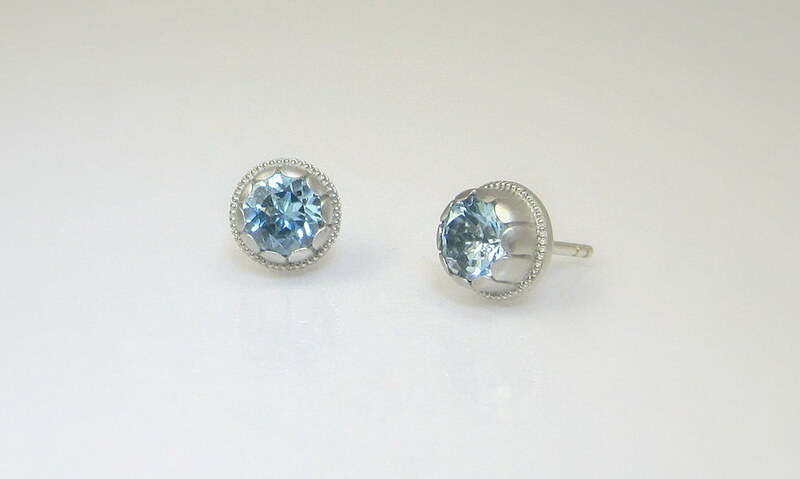 The petal-style palladium studs with milgrain detail were set with a pair of icy blue aquamarines. If you have any questions about these earrings or placing a custom jewelry order for the holiday season, feel free to email me at info@boothcustom.com.